Here are 20 mistakes you need to avoid when interviewing a job candidate. These are common mistakes most interviewers are guilty of. However, if you want to be a good interviewer and provide a great candidate experience, you should stop doing these mistakes! How to master the skill of conducting job interviews? Interviewing a job candidate is not an as easy as you may think. There are many different job interview types. It takes some time to find the one that works best for you and your company and master the skill of conducting a meaningful, successful interview. Training and gaining first-hand interviewing experience can help you to master the necessary skills and become a good interviewer who will hire the best person for the job and the company. It may take some time to learn how to structure and manage an interview and ask the best job interview questions. However, some common mistakes are easy to avoid. In this blog post, I will define and explain the most common interviewing mistakes you need to watch out for when conducting your next interview. Download our Ultimate Guide for Conducting Job Interviews! Here is the list of the 20 common interviewing mistakes. 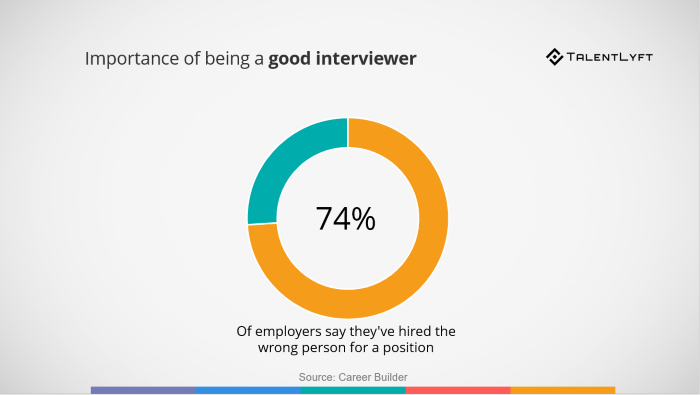 If you want to be a good interviewer, you should stop doing these mistakes! Candidates are likely to come to an interview on time because they want to make a good first impression. If you leave them waiting for some time, it can give the impression you don’t regard the interview as important and affect their performance. Most candidates come well prepared for the interview, and you should do the same. If you are unprepared, you send the message that you are not interested or that the company itself is disorganized. If you haven’t even spent a few minutes finding out what’s on a candidate’s resume before the interview, you risk asking irrelevant questions, leaving the candidate less than impressed. Resume evaluation should be done meticulously to avoid wastage of time and resources. You have to walk a tightrope between advocating for a job candidate and representing the company. You want to present the company in a favorable light to candidates, but you shouldn’t overdo this. You may also find yourself promising a candidate too much. One situation where this is evident is when you sweeten the compensation package by offering growth potential, a possible promotion, etc. and what is promised during the interview is unlikely to happen in reality. This is a common mistake that can lead to some very disappointed employees in the workplace. Remaining professional is critical when recruiting. This is not the time to create new friendships. It may be tempting to want to chat and get to know the candidate but sticking to employment-related questions is important. It’s offensive to ask a candidate certain questions such as “How old are you?” Asking a candidate for his or her religious affiliations, political persuasions or lifestyle preferences may even be illegal. The conversation should be focused on the role and the ability of the candidate to fill it. Organizations all have different hiring procedures. It’s important to let candidates know what to expect. Will they need to take a test to demonstrate their skills? Are multiple interviews required? If you give a brief overview of the process, this helps to put the candidate at ease and makes sure expectations are aligned. If you give the impression you couldn’t care less, don’t be surprised when candidates turn down any job offers. You are a representative of the company and a bad experience with you reflects badly on the company you represent. She was kept waiting for an hour for her first interview and then informed that the venue had changed to a local coffee shop. She went to the shop and waited for another half an hour before the person turned up and proceeded to grill her without an apology for all the inconveniences. The candidate should do most of the talking in the interview. Don’t embark on a monologue that goes on and on. Let the candidate’s comments spark your next question so you can gain valuable information you would miss by talking too much. Ask clear questions that demand in-depth answers. Don’t interrupt and give a candidate time to formulate an answer. When candidates do the talking, you can observe how they answer questions, pay attention to your their body language, evaluate their natural tendencies, find out about their experiences and record their answers. It’s a mistake to be too quiet as well, or candidates may feel as though you’re not responsive. In interview situations, you should ask open-ended questions, listen to the answer, ask a follow-up question, listen to the answer and repeat the process. Candidates have probably spent a lot of time preparing for an interview, and they deserve to be heard. When you listen to what is said, your hiring decisions are likely to improve. If you want to compare candidates, you need to have a basic set of best interview questions to ask job candidates. If you are inconsistent in your questions, you have no way to compare the answers. Skillful interviewers tend to follow a method, with variations tailored to the specific situations. A hidden danger of a lack of planning is a lack of an objective standard for proper comparison of candidates. A standard interview question list is usually grouped around experience, aptitude and interpersonal skills. Any questions that are overly complicated or rhetorical should rather be avoided. Empathy is a critical skill when conducting an interview. Candidates should never be treated as a resource. There’s a balance between being over-friendly and being completely impersonal. It’s important to show that you have a genuine interest in them and respect their qualifications rather than making them feel they’re involved in some cold, impersonal procedure. When candidates give non-specific, generic answers, you need to be able to dig down for a complete understanding. Find out exactly how they went about solving a specific problem, how many people they managed or what their role was in a certain project. Asking open-ended, accomplishment-oriented questions helps candidates to provide more details that prove their expertise. This can also help to uncover any inconsistencies or incorrect statements on their resumes. Companies tend to have their own buzzwords. If you use these in an interview, candidates may not know these acronyms or terms that are exclusive to the company. When you use clear language without any buzzwords, you avoid confusion and save time by not having to provide explanations. Companies look for traits like diligence, dedication, and motivation in employees. Creating a company culture that embraces such traits takes effort and resources. Running a team with an employee who does not ‘fit in’ is extremely challenging. If an employee is a bad cultural fit, a different work ethic may compromise the results of the whole team. The person can be disruptive or distracting to other employees. Specific job skills can be learned through mentoring and training, and they are more easily learned when a new employee blends well with the team. Motivation, which is part of the innate personality, is not so easily learned. Looking beyond a resume and assessing how the candidate will fit into the culture of the organization is one of the best ways to hire the right people. Many things can distract you during an interview, from answering your cell phone to thinking about an important email or an upcoming meeting. If you are distracted, the candidate may interpret this as a lack of interest. Candidates immediately sense when they don’t have your full attention if you’re unenthusiastic, don’t take any notes or look anywhere but directly at them. If you have an urgent matter you have to attend to, rather take a five-minute break and return to devote yourself fully once again to the interview. As a recruiter, you will not always approve of an answer given by the candidate. It’s not your job to correct the answer or make it obvious that you do not agree. If you think you may have misunderstood, you can ask further questions to clarify the candidate’s position. If a candidate is struggling with an answer, there’s nothing wrong with prompting a little to help focus a response. Candidates may spend hours preparing for an interview. Once they’re fully prepared and ready to shine, all they get is a rushed interview of 15 minutes that’s unfulfilling and aggravating. You need to schedule enough time with a candidate to determine whether he or she is right for the job. Rushing through an interview leaves a bad impression, and if you try to fill a required position in a hurry, you can easily recruit the wrong person. The more important the role, the longer each interview should take. A situation in which your judgment is colored by one particular aspect of a candidate – credentials, appearance or interests – is called the halo effect. This can cause you to overestimate the qualifications of a candidate. A negative detail can have the opposite effect. You are only human, and if you are aware of this tendency, you can do your best to keep it in check. 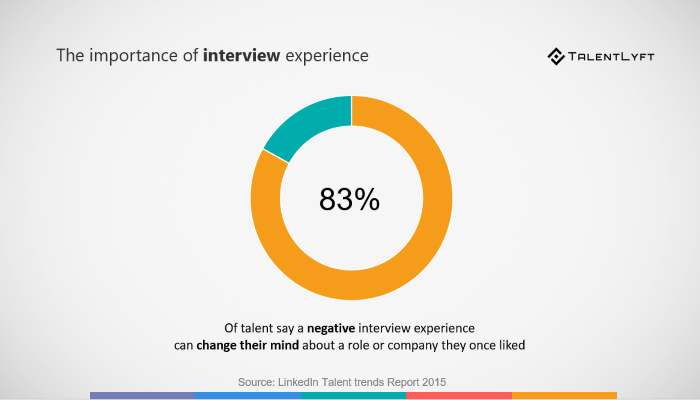 Personal bias is the reason why many HR managers use a hiring panel. One of the many benefits of collaborative recruitment is avoiding bias in recruitment. Optimally, people from different teams of stakeholders should be included in a hiring panel. For example, when hiring a software engineer, having a panel consisting of software engineers is not optimal. The panel should include people who would have to work with the individual on a daily basis, such as a project manager or someone from finance. Once the interview is over, impressions can be shared, and it’s interesting to see how someone else may have picked up on something you missed, or vice versa. Taking careful notes during an interview allows you to compare candidates and reveal gaps in your information. It also helps to offset a tendency to place too much emphasis on interview performance – someone who interviews well may not necessarily be as good a match for a particular position as an unassuming, more reserved candidate. If you don’t write down what a candidate says during the interview, you may remember what you thought was said rather than what was said. Reviewing your verbatim notes should jog your memory so that you can more accurately consider each candidate’s strengths and weaknesses. Without your written notes, it may be hard to determine which candidates make it through to the next round. Some recruiters have interview scorecards where they list key skills and accomplishments they require from candidates. If seven criteria may be used, including leadership abilities, sales skills, etc. ), candidates are then scored from 1-7, measuring them objectively against criteria necessary for the job. Another factor that can influence objectivity is the length of time between interviews. Seeing a poor candidate and a good candidate one after the other could make you see the good candidate as being better than he or she is due to the contrast. Having some time between interviews to review objectively can help you to avoid this. Taking good notes and reviewing them will give you a more accurate sense of how potential candidates stack up. Candidates do not want to hear that they don’t measure up to other candidates and that their chances of getting the job are low. Don’t undervalue their accomplishments. Avoid giving them any feedback during the interview. This should be saved for a post-interview rejection letter where you can choose your words more carefully. Sometimes you may be asked questions to which you don’t know the answer. Deflecting the question gives a bad impression, especially if you do it in a condescending manner. Rather be honest that you don’t know or that you can’t disclose the answer. Don’t try to lie or embellish as candidates will probably find out later and know that you deceived them. Your interviewing skills will grow as you practice them and gain more experience. Before long, you will develop the characteristics of a good interviewer and be able to manage an interview and structure it in the best possible way. Always be prepared, don’t rush the process, respect the candidate’s answers and be authentic. This will enable you to become skilled at selecting the best candidate for the job. Susan Saurel is a passionate writer from Texas. She is in love with traveling. Teacher of higher category, a writer for cheap essay writing service EssayWritingLand, Marketing Specialist, PM in an IT company in the past, lovely mom. She wants to share her experience and knowledge with readers and she has something to say, for sure.